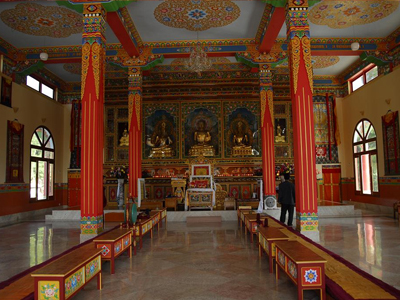 Located on the foot of Dhauladhar Mountain Range, Dorzong Monastic Institute (DMI) is a place for studying and practicing Buddha Dharma. 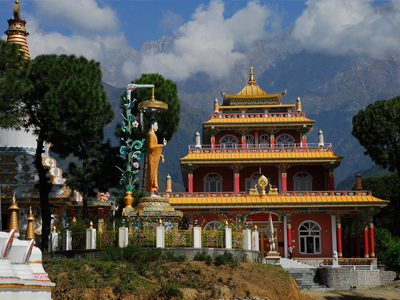 The institute is situated about 20kms from Dharamshala near Gopalpur village. It was established by Eighth Kyabje Dorzong Rinpoche at a scenic place that is covered with cedar forests to preserve the Buddhism and the Drukpa Kagyu community. 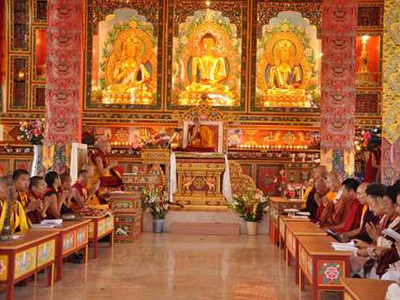 At DMI, students of the Himalayan border hill areas like Zangskar, Lahoul-Spiti, Kinnaur and Tibetans residing in India have the opportunity to study and practice Buddha Dharma and the tradition of their ancestors. Buddhist Festivals, Prayers and Ceremonies are also organized here and medical aid to the needy local population is provided. The institute is also recognized as the yellow roof monastery.